This past week the harvests were light because I've been trying to use up previous harvests. But the last of the winter brassicas left standing are now bolting so I've started removing them from the garden. Here's the net result from cutting down one of the Lacinato kale plants. There were just a few aphids on this plant, actually you can see a few of them on the stone at the bottom of the photo, most of them were hanging out near the base of the leaves. This batch of leaves was torn up and steamed in a pressure cooker for 1 minute. Some of the cooked kale went into a frittata along with some dried zucchini, dried cherry tomatoes, bacon, onions, cheese and seasonings. Another bunch of the kale was warmed with some of the lemony confited garlic that I mentioned in last week's harvest post, then piled on top of toasted rustic whole wheat bread spread with spicy hummus, the whole lot seasoned with a bit of agrodolce vinegar, coarse salt, and fresh ground black pepper. I'll mention another toast and hummus combo that featured a preserved veggie from the garden, I've still got a few jars of preserved sweet peppers from last fall, I cut some of those into strips and piled them on top of the hummus smeared toast along with some crumbled feta. When I set out my seed started onions I spaced them about 2 inches apart alternating the smallest seedlings with the largest and now I've started thinning out the smallest ones to use as spring onions. The bunch above went into a coconut curry featuring one of the Honey Nut butternut squashes from my stash, celery from the garden, mushrooms, and tofu. I've been trying to use up previous harvests, most notably lettuce - we've had a lot of salads and another round of lettuce cups, this time with shredded leftover chicken that I had lightly smoked in the Big Green Egg. And I've slowly been using up the Romanesco broccoli - one night I roasted some florets with brussels sprouts (to accompany the chicken) and another night some went into a souffle. The only other harvests for the past week were a few big volunteer Spanish Black carrots and celery, neither of which were photographed. Spanish Black carrots - 12.3 oz. Dorato di Asti celery - 9.8 oz. Lacinato kale - 12.6 oz. Spring onions - 2.4 oz. Week - 2 lb., 5.1 oz. Year to date - 61 lb., 2.1 oz. 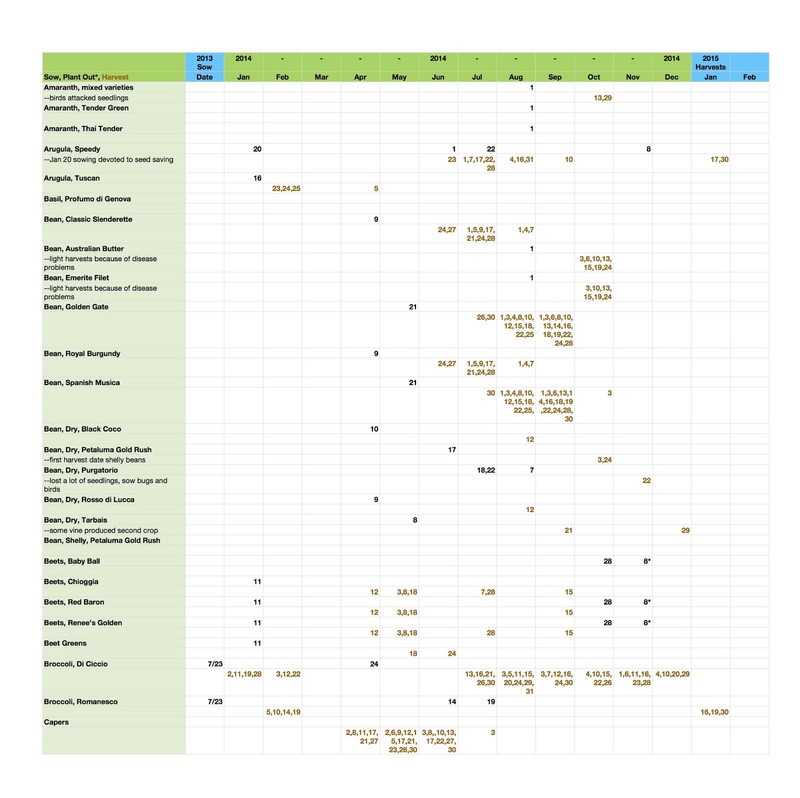 I mentioned a few posts ago that I had worked up a spread sheet that incorporated sowing, planting and harvests dates so here I'm going to share a sample of the 2014 document. As I mentioned in that previous post I have been keeping very detailed records of my harvests for the past 5 years and I'm working on doing the same for seeding and transplanting dates. I was pretty good at keeping track in 2014 so it's the first year that I've been able to work up a pretty complete schedule. It took a long time to pull all that information together so I'm selfishly keeping the rest of the schedule to myself. There's two lines for every single vegetable that I grew and/or harvested last year. The first line for each veggie shows the date that I sowed the seeds or set out the transplants. The second line shows each harvest date in brown. There's a separate column for each month of the year. There's also a column to show dates for vegetables sown the previous year and additional columns for veggies harvested in the next year. There's still one more month of data to input when February of this year is over and perhaps I'll add one more column to show harvests after February. It makes it easy to see at a glance how long it took from sowing or planting to the first harvest. I've included each harvest to indicate frequency of harvests. I toyed with the idea of adding one more column to show total harvest weights, but decided not to because that seems like TMI, I want to use this schedule for planning when to sow and how to plan successions, harvests weights don't really come into play for that. My 2015 schedule is already set up and should be easy to keep up with on a weekly basis or so. One thing that I want to work on this year is adding a few more notes, such as disease or pest problems, things to look out for in the future, or unusual weather such as extreme heat or freezes. I think I should also add some tentative dates for when I should be sowing some crops, add another color to the line of sowing/planting out dates. Here's another sample of my record keeping, I use iCloud Notes to record my garden activities, below is a cut a paste of January's notes. I have an iPad that sits on my kitchen counter most of the time and whenever I plan on sowing seeds I sit at the counter, make out my labels, and record it in my notes. When I come in from the garden I try to make a note of what I've done. I start a new note each month. This is the method that I use for keeping track of my harvests as well. Since the notes are kept in the cloud I can easily access them when I work on my desktop computer and input the data into my spreadsheets. At the end of the month I email a copy of the note to myself to keep a backup copy. Easy, really, it is. Spigariello Foglia Liscia - 4"
Purple Peacock broccoli - 4"
Reine des Glaces - 4"
Ruby Gem romaine - 4"
Sweetie Baby romaine - 4"
I'm finding that the better I am at keeping records that the better my garden becomes. My memory is terrible, I can't possibly remember everything I've done in the garden or everthing that needs to be done and when, especially when. There's so many things I've not grown because I've missed the correct time to get them started. Going back through my blog is always interesting and informative, but it takes too much time, I hope that my new schedule will provide at-a-glance information to help me hone my gardening skills. I haven't done a garden tour yet this year so I'm doing a bit of a catch up post. Looking back at the past month and a half I'm amazed at how quickly things can change. There was a trellis sporting some overwintered snap and snow peas in one corner (covered to keep the birds from pecking at the foliage), a patch of carrots, a couple of old Watermelon radishes, and bolting cilantro. The garlic which had been set out on November 19 was emerging at the far end of the bed (on the left below). In the foreground above I had just dug in a mustard cover crop. Normally I would mulch the area with newspaper, but I used the fabric because I was hoping for rain which would go through the fabric. And the other covered section that you can see below is where another patch of mustard was growing. Seed sowing continues through the year in my mild climate. These are seedlings of onions, shallots, leeks, and cabbage that were sown in November and December and were destined to be set out in this bed. It's not easy to see through the veil of tulle, but this section was planted with onion seedlings from Dixondale (January 3) and some homegrown onion seedlings. I covered the onions because the birds like to peck at them, they don't eat the onions but pull them out and make a mess of things. The birds don't generally mess with the garlic though, which grew noticeably in two weeks. January was clear and warmer than normal all month so the veggies grew quite quickly. By the end of the month I had cleared out the peas. The sections of the bed that are covered with Agribon had mustard greens dug into them. The worms were busy working their way through the feast of rotting greens. Some cabbage and Brokali seedlings that were to be planted in that space were sizing up in 1-quart pots (yogurt containers). It's still difficult to see but the onions were growing like crazy. And the garlic continued to grow. The other section that is covered with tulle is devoted mostly to shallots and a small amount of cippollini onions. A couple weeks later, just a few days ago. The near end of the bed is now planted with some Express Red and Pixie cabbages and some Atlantis brokali. They are all covered with tulle to keep the birds from pecking them to death. I don't wait for the birds to discover new treats anymore, I just cover things up, it reduces the oh s#1t factor. This year I'm experimenting with interplanting some peas for pea shoots. I'm working on using more cover crops this year and interplanting is one way to integrate a cover crop. I may get a few pickings of peas or not, either way the peas will help to protect and build the soil and perhaps provide some nitrogen for the brassicas. I'm thinking of naming my garden the Bridal Veil garden for all the yards of tulle and other white fabrics that are draped everywhere. It amazes me how quickly the cabbages which were sown on December 17 got to be so big. They weren't coddled for very long. I sow my seeds in 4-inch pots and set them on heat mats indoors until the seeds germinate, then the pots go outside right away to get natural light. I bring the pots in at night for about a week until the seedlings are off to a good start but then they stay outside night and day. That treatment makes for some pretty sturdy plants. The Brokali was quick too, those seeds were sown on January 4. This photo allows a better glimpse of how quickly the onions are growing. The Dixondale plants are in the foreground and my homegrown seedlings are beyond. This year I'm growing Candy, Red Candy Apple, and Superstar, all of which are from Dixondale. The onions started from seed include Rosso Lunga di Firenza, a red torpedo type, and Tonda Musona Bianca which should store better than the sweet ones from Dixondale, and Yellow Cippollini. The garlic varieties this year are Lorz Italian, Mild French, Early Red Italian, and Chesnock Red. Shallots include French Gray from sets (which are not doing well) and Zebrune from seed. Now let's take a look across the pathway at bed #4. There's been less activity in this bed. From the start of the year it has been devoted to two things. One side of the bed was sown with Extra Precoce Violetto fava beans and the other side with Kodiak mustard for a cover crop, both sown in December. The favas are growing in the bird netting draped cages and the mustard is growing under the protective Agribon. A month later you can see that the favas are well on their way and the mustard is filling in. Just a bit more than two weeks later the mustard is trying to push out from under the cover and the favas are filling in. What you can't see in the photo is that some of the favas are actually starting to bloom. Most of the favas were sown on December 13 and the smaller plants at this end of the bed were sown on December 23. The mustard was starting to bolt so that meant it was time to cut it down and dig it in. I used some hedging shears to cut the tops down. And then turned everything in. I had left the stumps and roots of the peppers and eggplants in place and those got chopped up and turned in as well. Next I'll be covering that section with sheets of newspaper to mulch it until I'm ready to plant the space with various types of bush beans in late March or early April. There's been more activity in bed #2. This was where the overwintered brassicas and other winter vegetables have been growing. The tall plants with the big leaves are the Romanesco broccoli. In the foreground are the celeriac and celery plants. Off to the left where there's a bunch of water bottles are some new chard plants. The fabric draped over the side of the bed is heavy frost cloth because we had freezing nights in December. The other water bottles are clanking in the breeze to protect some Lacinato kale and Di Ciccio broccoli. A couple weeks later not much has changed other than that I needed to cover the chard to protect it from, oh you know, the birds. The only new activity was at the far end of the bed where I had set out some bareroot Seascape and Albion strawberry plants. The birds had discovered a taste for radicchio and escarole so, you guessed it, more tulle. The nice thing about the tulle is that it is lightweight enough that it can float directly on top of the plants. I covered the strawberry starts also because I was trying to coax a quick crop of Golden Corn salad between the berry plants and the birds devour the corn salad seedlings practically as they emerge. The Tronchuda Beira plants were producing a lot of huge leaves, I was harvesting just the tender inner leaves by this time. The Romanesco plants are looming behind the Tronchuda Beira. There's a ratty tatty senescent Di Ciccio broccoli plant to the left. The first head Romanesco broccoli was ready to harvest that day. After cutting it out I cut the plant down to a stump which you might be able to see in the photo below. That's all the leaves from the one Romanesco plant. Note the sparse foliage on the broccoli in the bed just behind the big pile of Romaneso leaves. What a difference! Look at the edges of the leaves on the Tronchuda Beira. It took the birds about 1 day to do that. The Romanesco produced in a hurry and the Tronchuda Beira seemingly decided to bolt overnight, so I had the space that they had occupied cleared out by the beginning of February. About the only things in this bed that I didn't have to protect from the birds were the celeriac and celery plants. The clanking water bottles with the mylar strips seemed to be adequate to keep the birds off of the kale, which is great because every time I cover my Lacinato kale it gets terribly infested with aphids. The aphids haven't been a huge problem so far, although the kale is starting to bolt and the aphids seem to find the flower buds irresistible. This past weekend I dug my usual amendments into the spot vacated by the Romanesco and Tronchuda Beira, set up a new Micromesh tunnel and set out new seedlings of lettuces - Red Iceberg, Reine des Glace, Ruby Gem romaine, and Sweetie Baby romaine. Those were all sown into 4-inch pots back on January 18. I also direct sowed some arugula, cress, chicory, and radishes. Then on Monday I prepped the spot where the broccoli had been and direct sowed more radishes, baby turnips, and baby leaf kale. That spot is protected by some Agribon covering the soil, I need to harvest some of the developing radicchios further down so that I can put up another tunnel. Here's the radicchios and escarole. These were a gamble since I started them very late last fall (October 28). There was and still is a good chance that they will start to bolt before they form any proper heads. So far though they are sizing up and not showing signs of bolting. They are at least large enough now that if they do start to bolt I'll get something for my efforts. And finally, the fourth garden bed, actually #3. This bed started off the year well stocked with lettuces, radishes, turnips, spinach, and other greens that I had sowed last fall, mostly in October. Mostly lettuce in the photo above and Cilician parsley, arugula, radishes, turnips, rapini, and spinach shown below. A month later it doesn't look like much has changed from this angle. But the arugula had started to bolt and was cut down to the nubs, most of the radishes were harvested, and the remaining rapini was bolting. The lettuce had formed heads and I was starting to harvest them. It's difficult to see here, but there's more gaps in the lettuce patch and the rapini is blooming its heart out. I wish I could uncover the rapini to feed the good bugs, but you know what would feast instead. And last and usually overlooked, one stray in the garden that is looking good this year. I've had an artichoke growing in a pot for years now, it's been there so long that I don't remember what variety it is, something Italian. It has always struggled along, generally neglected, often under watered, not always fed. Last year I gave it a shot of the mycorrhizal and bacterial inoculants that I've been applying in the garden, hooked it up to the drip system, and whoa mama, look how it has responded! Not bad for a rootbound specimen sharing space with a volunteer red fennel and who knows what else in that pot. So, that's the "winter" garden this year. I won't claim that it is typical. A month of sunshine and warmth when it should have been cold and rainy made for a bit of gardening heaven. It will be interesting to see what "spring" has in store for us here. Weird Weather resumes. Truly, if the days weren't still short I would swear it's summer. Actually it's better than our typical summer. Highs around 80ºF and lows around 50ºF. My winter veggies aren't necessarily loving it, especially the lettuce. I'm in the process of clearing out the lettuce patch, trying to keep up with bolting heads and fungal diseases brought on by the warm weather while the garden is still drying out after the previous rainy weekend. That's the last of the butterhead and Ruby Gem lettuces. The outer leaves on the butterhead were turning brown and the Ruby Gem was bolting and getting a bit moldy on the oldest leaves, most of the leaves were still very good. The baby turnips are getting to be about golf ball size (just in time for the AT&T), but are still sweet. I sliced a few very thin on the mandolin to include in a salad of most of the Ruby Gem romaine, the last radishes from the garden, and shaved fennel. I experimented with a new version of my confited garlic by adding a small quartered Meyer lemon to the garlic. The salad dressing included one quarter of the confited lemon and some of the confited garlic, both minced and whisked with fresh Meyer lemon juice, part garlic oil and part fresh extra virgin olive oil, plenty of fresh ground pepper and a dash of Red Boat. The fennel patch is an interesting mix of new bulbs and bolting bulbs. The new bulbs aren't as fat as bulbs that would form on new plants (the plants were sown a year ago), but they are tender enough to shave and use fresh in salads. They're also good for cooking. Not photographed last week was a big Spanish Black carrot, another celery root, and a few stalks of celery. I used the carrot and celery root in a braise that included some of the Romanesco broccoli harvested the week before. Spanish Black carrot - 7.1 oz. Dorato di Asti celery - 8.6 oz. Monarch celeriac - 8.5 oz. Romanesco fennel - 12 oz. Rhapsody butterhead lettuce - 1 lb., 7.7 oz. Ruby Gem romaine lettuce - 13.2 oz. Helios radishes - 3.1 oz. Selzer Purple radish - 1.6 oz. Mikado turnips - 1 lb., 12 oz. The total harvests for the past week were - 6 lb., 9.8 oz. Which brings the total harvests for 2015 up to - 58 lb., 13 oz. I've collected lots of harvest data over the past 5 years so I thought it would be informative to see how the different years compared on a broad scale and in particular how 2014 stacks up against previous years. All this information is also good for planning for the coming year. One of the first things that I looked at was what was new or what I finally had a measure of success with in 2014. Those items are highlighted and a few things really stand out. Arugula. I finally found an arugula that I really like and that is really easy to grow. I used to buy it regularly and now I harvest it regularly. I'll have to do a spotlight post on Speedy one of these days. Cauliflower, this was the first year that I ever had success growing cauliflower and I managed to pull it off twice with a summer and a fall crop. My first experiments with growing flint corn were pretty successful. One row of the Floriani Red didn't pollinate well so I may experiment with bagging corn tassels this year for doing hand pollination. I've been fooling around with fennel off and on over the years without a lot of success. Last year was better than usual, but I still need to work at it. It's one of those veggies where timing is critical for success and I still haven't nailed down the right time to start it. Gai Lan was a first in 2014. I liked it a lot and I'm going to continue to grow it but I need to make some improvements, such as figuring out the optimal spacing and just how much to grow per succession. Now I wish I could figure out how to grow Yu Choy, I've only ever succeeded in growing it once. That could be a project for 2015. The big jump in the onions was because I advanced from growing just scallions and bunching onions to growing bulbing onions too. Radishes. Such a basic vegetable to grow but I never had significant success before, never enough to bother to record, and that was likely because I haven't loved them enough to be bothered to figure out how best to grow them or to keep successions going. It helps that I've expanded my interest away from just salad radishes to other types of radishes that are more versatile in the kitchen. Wheat. An experiment that I won't bother to try again. It was fun to watch it grow but there's no way I can grow enough to meet my needs and I'm sure the quality is no where near that of wheat that I can buy. The space is better devoted to something else (like more onions!). Not highlighted but worth noting is a renewed interest in growing Mizuna. 2014 was the first year that I experimented with growing it as a cutting green. I actually use it when I grow it that way. In the past I always waited for it to form a head and then when it did I didn't get around to harvesting it, so it bolted, so it went into the compost. My overall goal for the year is more variety. I grew a larger quantity of pantry items in 2014 and would like to maintain or increase those types of crops. Dried beans can keep for a couple of years and the more I grow the less I purchase. (Sorry Rancho Gordo) I may plant more dried beans in place of snap beans. I've been growing two varieties of snap beans per trellis, this year I'll try three - more variety less overall production. My husband loves garbanzo beans so I'm going to experiment with some this year. The flint corn will also keep a couple of years so this year I'm trying 2 or maybe 3 flour corns. Too much zucchini! I didn't fully appreciate how grossly over productive the hybrid Romanesco zucchini is (first grown in 2013) until I looked back at the zucchini harvests when I grew other varieties. I'm not growing that variety this year. Too many cucumbers. I don't do pickles so one or two plants should suffice. Really Michelle, just 1 or 2 plants. More winter squash. The mini butternuts weren't as productive as expected. I'm going to add another small squash to the lineup. 48 pounds of broccoli was a bit much. I did freeze some and the frozen broccoli is perfect for making the nearly weekly frittata that I make for Dave for his lunches, but I'm going to cut back. We'll actually, that's sort of a lie, I'm expanding the varieties of broccoli that I'm growing, but they aren't as long cropping as Di Ciccio, so more types with fewer harvests from each plant, more successions. 48 pounds wasn't really too much, but 48 pounds of one variety might have been. More variety! Fewer tomatoes. I want to try to grow as many or more varieties but do some pruning to limit the overall productivity. I'm still working on canned and frozen tomatoes from 2013! I'm not yet ready to cut back on peppers or eggplant. Well, actually I did cut back in 2014, the previous year I had half of one bed devoted to peppers and about a third of another bed devoted to eggplant and peppers. In 2014 I put all my solanums in one bed, the peppers got less than half the bed and the eggplant less than a quarter, the tomatoes got the rest. The plants were just more productive in 2014. Let's take a look back at previous years. 2010 was a mixed year. I had two big problems in the garden that year, both of which convinced me that I needed to invest in having some BIG planter boxes. First, gophers and moles had discovered my beds and figured out how to circumvent the wire mesh that I had lining the beds. It became nearly impossible to grow root vegetables because if the gophers didn't eat them the moles pushed them around. That's when I gave up trying to grow potatoes, I didn't (still don't) like them enough to make those battles worthwhile. Second, the nearby oak trees were sending their roots into a couple of the beds and sucking up all the water and nutrients. My peppers couldn't compete that year and produced nearly nothing. The tomatoes had a difficult time competing as well. I had more tomato plants in 2010 than 2014, 11 plants versus 8 (to start, Black Krim met an early demise) but the 2014 harvest was nearly 150% of the 2010 harvest. Note however the 17.5 pounds of kohlrabi. I had no problems with growing kohlrabi, but we didn't eat it all, it languished in the fridge until it went into the compost. Lesson learned, I haven't grown it since. Looking back at 2011, the annual total is the lowest because it was a horrible year for rats. There was a population explosion all over the valley and they were into everything. They ate more of my tomatoes than I did, the total for the year was half what it should have been. They destroyed my strawberries entirely. Cucumbers seemed to be another favorite, especially the babies. Oh, and melons, I actually grew melons that year but didn't get to harvest a single one, none of them got anywhere near maturity because the rats ate them, all of them. Peppers were another tasty rat treat. Seemingly just about anything was on their menu. Favas were a success because they matured and were harvested before the invasion. You may notice that 2012 was an off year for certain vegetables, that year was an anomaly because each garden bed was out of commission for at least part of the year because I was converting them from barely contained mounds to full on planter boxes. There were some "must grow" veggies that I didn't have that year, including favas, garlic, and winter squash because the space didn't exist when it was required. It's interesting to note that even though I didn't grow some significant producers that year the total harvest still exceeded the harvests in the two previous years. That difference and the increases in total harvests for 2013 and 2014 really help me to rationalize the investment in those big boxes. I started off 2013 with 3 planter boxes, the last one wasn't constructed and filled until May, so that had an impact on the total productivity for the year. One of the things to note about 2013 is that it shows a few of my efforts to adjust what I grow to meet my needs rather than what is possible. For instance, I halved the amount of space devoted to fava beans, 100+ pounds far exceeds what I can use. I cut back on the number of tomato plants as well. I tried to get a little more variety into the harvests too - carrots made a return, another attempt at fennel was made, melons escaped the notice of the rats, and I managed a few harvests of pak choi. Other things however were out of control, most notably zucchini and cucumbers - but that doesn't mean I cut back on those in 2014, some lessons are more difficult to learn than others. I don't know what motivates other gardeners to blog about their gardens, but for me the primary reason is to document what's going on in the garden and being able to look back at past experiences. My memory is short and in general I don't remember what worked or didn't work. I don't remember what was growing when or how well it did. There are only a few crops that I remember the planting schedule for and when I can reasonably expect a harvest. My blog allows me to go back and see how the garden performed, how I performed as a gardener. But blogging is just one tool in the shed, I've found that weighing and keeping track of my harvests helps me to decide what and how much to grow. What the blog doesn't show are the notes and spread sheets that I keep. In 2014 I seriously started working on keeping track of when I sow seeds and when I set out transplants. This past weekend I put together a spreadsheet that integrates that sowing and planting data with the harvest data for 2014. I hope this new tool will help me to refine my planning and improve the successions. I'll write a bit about that in a future post.